My brief tenure as a founding member, and contributor to policy development, of the Women’s Equality Party (or WEP) is, I fear, up. As I had feared when the party first came into existence: Some women are indeed more equal than mothers. Because once you strip away the hoorays, quiet down the ‘you go, sisters’ and whittle down the cash for access subscriptions caste donations system, this new party is less ‘Women’s Equality Party’ and more ‘Women Employees’ Equality Party’ (WEEP). Today, WEEP – a party essentially formed and dominated by journalists and women of privilege and status – officially launched its policies at Conway Hall in London. Above the stage read the words ‘To Thine Own Self Be True’. Amen, to that. With patient reflection since I became involved in the party from its inception and during the policy development process, I have to be true to myself and own my disappointment at the way the party has, like other mainstream parties, missed a trick. It risks failing women because it seeks only equality – the poorer sister of women’s liberation – meekly seeking to rock the boat instead of building a new one. In fact, I don’t think I heard the word ‘feminism’ mentioned. Once. It risks failing women because it seeks only equality rather than justice, fairness and true representation of women. And it abjectly fails mothers because it fails to acknowledge them except as in the capacity of employee. It fails to explore radical ways to lessen financial hardship for women from across the social spectrum or to reshape the way we value care and those providing care. Rather, the party was alive with youthful enthusiasm, professional and boardroom concerns, and blinkered talk of workplace equality, with no regard to the complexity of peoples’ lives, the diversity of women’s lives and experience and expectations and struggle and desires and strengths and talents. It talks of unfulfilled potential of half the population: conveniently neglecting the wishes of those women. I had had the potential to reach dizzying heights of the legal profession. Did I want to? No – I wanted to stay at home with my children. I am making use of my skills in other ways, no less important. Women’s equality is only ever going to be a polite nudge, a request within the rules of a previously scripted box which says ‘this is the game: play it or get out’. And my goodness, the WEEP party really is playing the neoliberal, capitalist game. So how did I even become involved in this WEEP party? After banging on virtual doors since its inception to engage with the party and to invite the party to engage with diverse groups of women, including those which campaign for mothers, single mothers (still the huge majority of lone parents) and women not in professional or elite circles, I was let in. The policy development in the already set brief of ‘equality in parenting’ – which I immediately challenged as blinkered – was coordinated by an employee of the Fatherhood Institute, and contributed to by men and a small number of women one of whom, let’s put it this way, suggested that a mother at home is a ‘complete waste’ and compared ideas to support mothers to be with their children as fascist. Yes. Really. Whilst ostensibly a women’s party, it is so busy apologising for its existence that it has blithely held up mothers and their children as sacrificial lambs. WEEP is giving every impression that women need liberating from full-time mothering, and that only participation in the workplace can lead to ‘equality’ – a view I cannot share. A mother’s place should be wherever she wants to be. After suggesting that WEEP might wish to expand the diversity of its working group on the ‘parenting’ issue – although, for a women’s party, surely the word ‘mother’ somewhere, and linked with something positive rather than ‘burden’ and ‘penalty’, wouldn’t go amiss – no mother’s group was brought on board until I insisted that Mothers at Home Matter and Global Women’s Strike were brought in. Both represent a significant number of mothers who want to (but are frustrated financially in realising their wishes) or those who do (by choice but at huge financial sacrifice) care for their children themselves. We may as well have stayed silent, like the voices of millions of women busy caring for the families, young and old – always ignored, often derided, when not patronised or humoured. Within WEEP, mothers are seen as a problem to be solved. The debate is still ‘childcare’ and effects on equality in the ‘workplace’ and the ‘pay gap’ of bearing children. Men, women who pursue the career trajectory rather than the family care line (as is their right) and representatives of father’s groups, kept the policy gate on parenting, as though the price to pay for a party seeking to end violence against women is the surrender and trade-off of any ‘privilege of motherhood’ and the denial of the existence and value of maternal care – for mothers and children, and, indeed, society at large. In effect, the horse-trading at the heart of a party seeking to champion the rights of women is reinforcing the prevailing and insidious mainstream discourse of disrespect, silencing and devaluing of a mother (and there are many) who wishes not to re-enter the workplace while she has dependent children – and is either struggling by financially to do so, or struggling by emotionally in her job while wishing to be at home instead. WEEP’s premise for its policies on women who are mothers can be inferred thus: her ‘responsibilities’ are decreed to be at home AND in the workplace (irrespective of her family’s wishes, or any wider argument that the work she performs AS a mother, raising and caring for her young children, is itself important work of value); her needs and role are to be subsumed into ‘parenting’; and a gender split 50:50 in matters of the home as though this is something universally desired by every family, every woman, every man, every child – someone tell my children, who, until at least 2 were very often ‘Daddy? Schmaddy. I want my Mummy’. You know, the stuff which might actually protect and support women who are also mothers – the vast majority of us. Despite our efforts, the ‘economic’ and ‘genderless’ agenda pushed through as though we were never there. Suddenly, the familiar picture of ‘affordable’ and ‘high quality’ childcare and split parental leave took shape as though we had never dared to raise the significant number of families – millions of women – for whom this is not what they would prefer; as though they are an aberration on the image of superficial equality. Sophie Walker, in her speech, quoted a ‘stay at home mother’ who wanted help getting back into the workplace – conveniently failing to quote the thousands of us who were contributing to the policy development through their voice-piece Mothers at Home Matter, or the hundreds who contacted WEEP on email and social media, or the massive number of mothers who, according to statistics, would prefer more time, or exclusive time at home with their children. It repeated the Labour Party’s trick after it came into power in 1997 when it completely erased mention of data in an important study, which it itself had commissioned, which showed that a significant number of women actually wished to care for their children (a figure remaining as true today as then) – preferring instead to push forward with its version of equality, employment as panacea, and branding women at home just ‘baking cupcakes’. It’s a trick which is well tested – and such a disappointment to see the WEEP party ideologically repeating it, in the name of women. So, no, sisters. Not in my name. So sad. I had a hunch this is where they’d be headed, but much admired you for fighting your way in. Well done. Perhaps there’s a (depressing) insight into the endemic political problem with motherhood – after all if a women’s party can’t fight for mothers, who can? Also, madness that the “Women’s Equality Party” wanted to keep stuff “genderless”! Sadly not surprised in the least. I thought about getting involved but somehow knew this is what it would come to and my views (cap on working hours for everyone and UBI) are even more radical than your own (though I know you support them too). I’d never be welcome in WEEP. I shudder to imagine being a part anyway. Disgusting. They are the Women’s Middle Class Employee Equality Party. How have we come to this, where liberals look like conservatives? ‘True representation of women’ ????? Your blog implies that being a mother is the true representation of women. I agree with you that we need to give higher value in our society to those who provide care, but to all who provide care not just women. The reality is women do still provide the vast majority of care and we urgently need to take policies forward that address how our society values care and improve the lives of those providing care but not ones that continue to keep it as a ‘mother’/woman only preserve. I am a mother, I love being a mother but it doesn’t represent the whole of my womanhood. Thank you for your comment, Jo. A true representation of women must include our diversity, our different needs and want and circumstances. I do not suggest, and do not believe, that being a mother is the true representation of womanhood. I agree with you that policies are required which enable women to be free of the assumption that childcare responsibilities fall to them as that works against women. However, to confine policies to the model of shared parenting and dual work/care responsibilities does not encompass those many women for whom this is not preferred. It does not go far enough in extending choice and freedom to choose the form of one’s family. The majority of women in the world become mothers at some point in their lives, or experience pregnancy, or pregnancy loss, for example. A politics which ignores this – only addressing motherhood in the context of burden and penalty – is not going to achieve justice, fairness and true representation of women in all our complexity and different circumstances. On my lips yesterday was bell hook’s question “ain’t I a woman?” – because, for everything discussed, when we ignore the wider issues relating to mothers (who are women) who want to care for their families, their economic vulnerability and penalties and more, we cannot claim to be a party representing all women. It is a party representing its own preferred model. One which did not include me or many many women in this country. 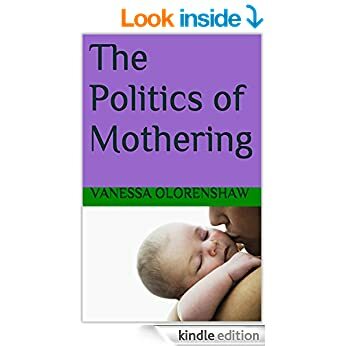 I left the launch yesterday knowing that, as I had written in the pamphlet the Politics of Mothering, mothers who mother (or who want to) are persona non grata in politics. I remain disenfranchised – as the policies of WEEP do not even begin to address issues of importance to me as a mother. An example of the party’s failure to go far enough, for example, is on Channel 4 last night, the leader Sophie Walker dodged questions about tax credits or austerity – measures which are overwhelmingly affecting women and children. I imagine your unease about my piece stems from a prevailing awkwardness in politics and feminism to address the mother issue, out of fear that it suggests a woman is not a woman unless she is a mother (come on, now – really? ), or that a woman who is a mother must do the care work (again, – really? – not something I or other organisations advocate, rather, it must be the individual family’s choice), or that a woman must be defined as a mother first and foremost (something I have always been at pains to resist). It is demonstrative of the taboo surrounding maternal care and policies which fundamentally and exclusively focus on mothers. I thought this blog and your reply to this comment hit the nail on the head beautifully. Thank you. No, the author does not say that being a mother is solely the true representation of women. She says that the role of motherhood is devalued, undervalued and perpetually eroded in our society and culture. She is saying WEEP have missed a trick and I wholeheartedly agree. It was refreshing to read this, although depressing. Having been in paid employment when I had my first child, I stayed at home when I had subsequent children. The reasons I gave people for not returning to my job were that childcare costs were too high, the job involved too much travel etc . While these reasons played a part, I didn’t feel I could admit I felt I missed out with my first child and just wanted to be around more for my others. Wanting this didn’t seem a socially acceptable reason for doing it. Thank you for attempting to give voice to these concerns even if people choose not to listen. It is one reason why I now support unconditional basic income for all. Interestingly the sort of mind-set forming the WEEP is the one which insisted that WfH back in the day, and now UBI, would ‘institutionalise women in the home’ rather than simply give women (and men) more choices about what they do. Well done for articulating this so well. I have also felt great frustration at the initial excitement of this party being formed and then sadness at the direction and prescriptiveness it has adopted. I have written a book that addresses the evolution of the women’s politics from the Englightenment on and argues along with certain French, Italian and Spanish women’s groups for a whole new conception of politics. I couldn’t believe that the new party could remain so ignorant of women’s history and the great variety of female desires to seek freedom according to themselves, and their experience in the world, not an outdated, already failing male project. My book is The Symbolic Order by Caroline Wilson. Should something new be created? If so, what form should it take?